Trust me – you´re not alone with your troubles. There are many others who have to learn German prepositions, and from my own experience as a teacher of German grammar I would say that it is a real struggle for almost everybody. The biggest problem here, is that prepositions are rather abstract. Moreover, there are no evident signs for which case to use with prepositions! Of course there are many prepositions; here I present the most important ones, which will already take you a long way. Most students find the matter of German prepositions of change difficult. Why? Because it’s simply too abstract and there´s too much information. Choose a song, that you like and whose melody you can easily remember. In principle, it could be any song. You can then do the same for the dative prepositions and the two-way-prepositions. Choose a song, arrange the prepositions according to the melody, add the case rule – and you will see, that it is easier to learn which case is used by these German prepositions. Is this too much work for you? Don’t you fancy singing yourself? No problem! I have already taken care of that for you. You find the accusative-song and two more songs all in the POWER-Learning-Kit “Learning German with Mnemonics”. But why did I write the accusative prepositions in blue? Colors can be powerful aids, when dealing with the comprehension of the German case system. Especially in connection with the prepositions, with the help of colors one can bring a lot more clarity and comprehension to the chaos. Use blue for the accusative and red for the dative. Why exactly these colors? In principle, you can, of course, choose other colours. I have chosen these colors for the “German grammar POWER-Learning-Kit” for a certain reason and with this I have developed a vast system. But that would lead us too far at this stage. OK, now write all the accusative-prepositions in blue in your vocabulary-notebook or – even better – on your flash cards. You’ll memorize the color quite quickly, and it will be easy to remember that these prepositions use the accusative. Now, do exactly the same with the dative-prepositions, but make sure to use red. Now, guess which case has to be used here? I bet you clicked correctly on “DATIVE”, didn´t you? You see at the first glance that it is about a position. Moreover, the dative is integrated in the image by the color red. Just as you can see immediately in the next image that the accusative follows the preposition “hinter” (behind). Are there more such images? How much simpler would it be to teach or learn German prepositions using mnemonic images? This way it’s a lot more fun, isn’t it? I am happy to tell you: “yes”. Such pretty mnemonic images exist for all the German two-way-prepositions presented here, and they’re even available as posters, in A4 paper format! Moreover there are, many more mnemonic illustrations which will make your learning of German grammar a lot easier. And, yes, it doesn’t matter whether you’re a student or a teacher – it’s a lot more fun for everyone! Prepositions as well as many, many other problems of the German grammar – you’re guaranteed to learn them more easily with this standard work for learning or teaching German grammar. 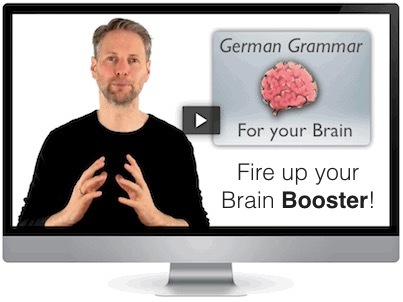 Learn German grammar with mnemonics – The German grammar POWER-Learning-Kit!